I've spent 10 years as a radio producer, but this here is my first story published in print! 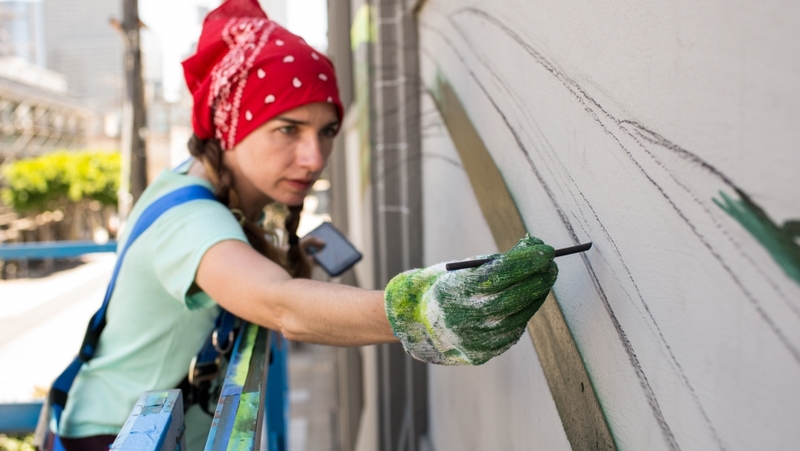 Thanks to Bay Nature Magazine and muralist, Mona Caron. I was a production assistant on this beautiful documentary from The Kitchen Sisters. Here's what they say about the piece" Mark Dubois, co-founder of Friends of the River, Earth Day and International Rivers Network, began as a river guide who opened up rafting trips to disabled people in the 1970s. Dubois protested the damming and flooding of the Stanislaus River by hiding himself in the river canyon and chaining himself to a rock as the water rose. Katie Lee, born 1919, a former Hollywood starlet, ran the Colorado through Glen Canyon long before it was dammed and in 1955 was the 175th person to run the Grand Canyon. An outspoken conservationist, singer and writer, she has spent her life fighting for rivers. Ken Sleight, now 83, is a long time river and pack guide and activist in southern Utah who fought the damming of Glen Canyon and filling of Lake Powell. An inspiration for Ed Abbey's, Monkey Wrench Gang, Sleight is currently working on the campaign to remove Glen Canyon Dam." Khaled Almaghafi, an immigrant beekeeper from Yemen, now lives in Oakland, California, but keeps up his family's traditions as civil war tears them down back at home. WHYY's The Pulse: Could Precision Medicine Advance Goals of Racial Equality in Health Care? With President Obama's support, precision medicine is gaining ground. A new $215 million initiative plans to study a million patients nationwide to advance understanding of how to target specific treatments to specific individuals based on their type of disease, lifestyle, environment, and DNA. But there are questions about who will benefit and who may be left out. People of color have historically been left out of clinical research. So can precision medicine bring them into the fold? For some diseases, like asthma, it may be critical to do so. This is a story I reported for The Pulse at WHYY in Philadelphia. Getting in to medical school is hard enough. If you're undocumented, it's even harder. But recipients of Obama's Deferred Action for Childhood Arrivals (DACA) are pushing open the doors of med school. This piece first aired on NPR's Latino USA. In a California Healthline report by Ali Budner, experts discussed the possible pitfalls and promise of SB 4, a recently introduced legislative bill that would provide health coverage to the uninsured. The effort comes on the heels of two major shifts in low-income programs -- the expansion of Medi-Cal to include millions more Californians, and the recent federal executive action that extends temporary work status and other benefits to millions of the undocumented immigrants in America, including the roughly 1.5 million undocumented in California. Since the nuclear disaster in 2011, Fukushimans have been grappling with the question: Is our food safe to eat? Fear and Eating in Fukushima examines how Fukushima residents answer this basic question by walking the line between trust and fear. Lesley Philips and Sharena Thomas of The People's Community Medics. Photo: Sara LaFleur-Vetter. The Race To An Emergency traces the path of a 911 call in Oakland, California. As we explore the inner-workings of this vital public service, we also aim to answer a bigger question about the emergency response system: does it serve all Oaklanders equally? The Race To An Emergency was honored with the 2014 National Edward R. Murrow award for best radio news documentary in a large market. It also won several other national and local awards. Rebecca Burgess -- activist, natural dyer, and founder of Fibershed -- talks about her wardrobe, entirely sourced from within a 100-mile radius of her home in the San Geronimo Valley, California. Four young women take on an old craft in the Richmond District of San Francisco. City parks don't just make themselves. They have to be planned and created, sometimes built into the map of a city, sometimes carved out as an afterthought. How does it work? One city planner offers historical insight. The annual bicycle music festival is rolling! Pedal-powered... everything. Opera included.